[media id=45 width=600 height=370] This music video for Arkadia Picture was shot on 35mm Film on a houseboat in beautiful Sycamouse, BC. Produced by Alex Galanis and Directed by award winning Stephano Barberis with cinematographer Ron Williams C.S.C. The video echos the sentiment, “When life is rough go sit on the lake and put some alcohol on it”. You heard it from Gord Bamford and his band. Happy summer. Factoring in 41 years of inflation since Woodstock ’69 LOVE has somehow managed to stay free in Canada suggests, The Higgins, in their first single from their second album, Dreamers Like us, which is scheduled for release in Spring 2010. 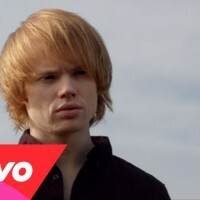 [media id=33 width=600 height=330] Official music video for “Free Like Love” by The Higgin. Directed by multiple award-winner Stephano Barberis and produced by Arkadia Pictures Inc. Scroll down for a technical lighting summary of the setup. Lighting Summary: We rigged the stage for cinematographer Ron Williams C.S.C with a 4×8′ softbox above the band. 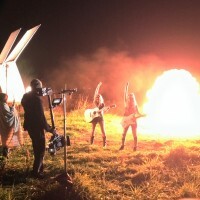 The rig consisted of 3 blondes and a frame of 216 diffusion. It was built with pipe and burtons from a goalpost allowing it to “pendulum” down so the angle of light would be less overhead and more in the eyes of our talent. Due to the weight of the rig our goalpost consisted of three 20′ schedule 40 pipes (1 1/2″ Aluminum) joined together into a triangle formation using Modern Studio Equipment mini-truss brackets. We cranked the rig up in super-crank roller stands (12.6′ max height). The wheels on the stand allowed us to roll the entire rig closer to the camera to make the lighting more frontal for the closeups. Of primary concern to Ron was beauty lighting for the band’s two female musicians. In addition tot he softbox over the stage we filled from over the heads of the crowd using a 10k fresnel through a 6×6 frame of half grid cloth. We used solid blades and flops to cut most of the spill off the crowd so it would project over their heads into the eyes of our band. There was also two tungsten units on the ground through diffusion frames to fill from below the stage in front of the band because that was the direction they would look down at the crowd. These units were hidden from camera between the crowd and the stage on the ground. Technical Notes: If doing a similar rig consider using a specialized truss lifting support from the theatre/live event industry in place of super-crank stands. They are usually load rated much higher then super-cranks and some of them can go upwards of 20′ in height which would be a huge asset if the stage was any higher (compared to 12.6′ for a super-crank stand). Also consider using real truss for less sag across the span. We used ropes and pulleys from the truss of the studio to safety our rig but if you didn’t have access to a lift to get up there you’d certainly want to make your truss more rigid.